Have you ever wondered why so many Singaporean students struggle to speak fluently and write competently even after years of Chinese tuition and enrichment? 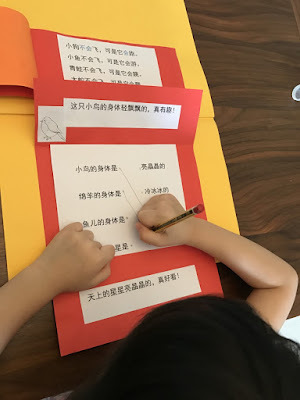 Ever since I announced that I will be launching the Chinese Lapbookers programme in Term 3 (click HERE for details), many parents have asked how this programme is different from the Bright Minds Lapbookers, besides the language of instruction. 2. to build a strong language foundation so the child can competently write short stories and compositions (作文) and with ease once he starts Primary school. Parents whose children have attended/are attending my classes will know that the lapbooks we create in our Bright Minds Lapbookers programme are DIFFERENT from those shared online by others. Our lapbooking process is NOT about reading a story, making a few crafts and doing some worksheet- based activities. Learn more about Our Lapbooking Style and Why It Is So Effective! 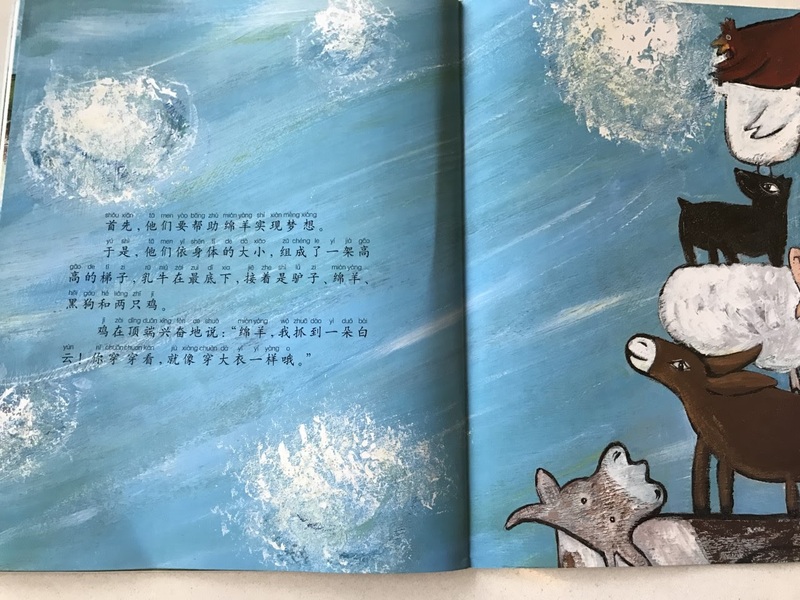 Similarly, for our Chinese Lapbookers programme, it is NOT about reading a Chinese story, discussing in Mandarin and doing a few crafts while speaking Mandarin. 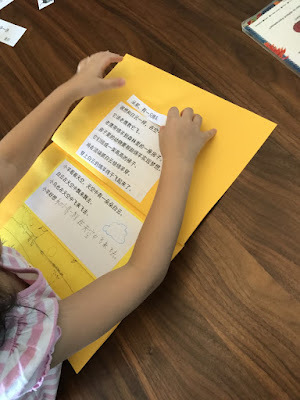 Even if we add in some word recognition and writing activities, it is still insufficient to achieve our main objectives (as stated earlier), especially for children from English-speaking families. 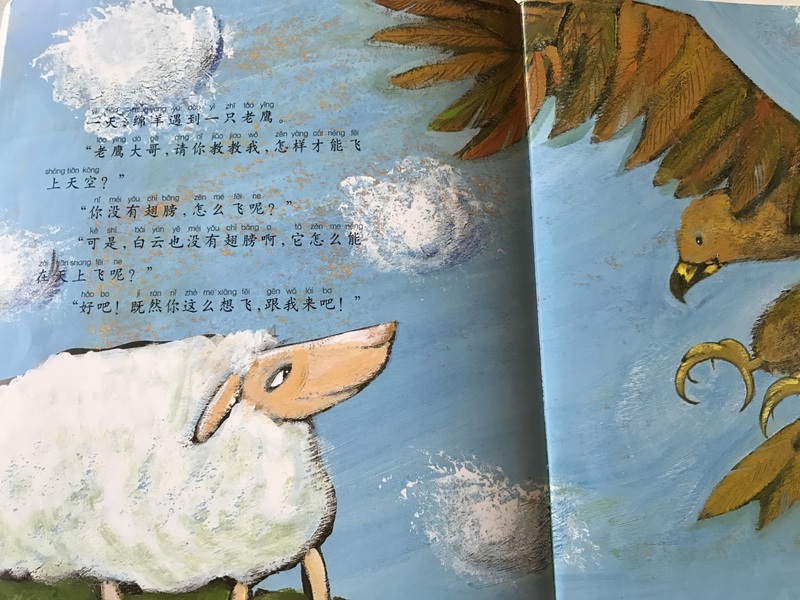 Reading lots of Chinese storybooks with a child and doing word recognition activities may be possible to teach a child to read Chinese words. Drilling with assessment books may teach kids to fill in blanks and answer questions. Teaching a Kindergarten 1 or 2 kid ahead of the Primary school syllabus is possible to create the impression that the child has a strong foundation. But do all these learning activities truly build a strong foundation in Chinese? With enough drilling (read: lots of assessment books from Popular), kids may be able to ace Primary 1 and 2 Chinese curriculum. But once the 作文 component is introduced in Primary 2, the child's real standard will show. Those with weaker foundation will struggle to write a decent piece and many have to resort to memorizing model compositions. 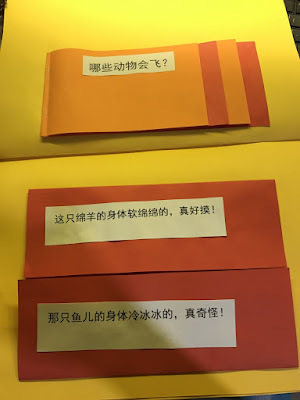 Parents with kids already in Primary schools will know that many kids cannot express their thoughts and views or hold a decent conversation in Mandarin fluently, despite scoring above 85 marks (band 1) in exams. This is fine in lower Primary, but if this problem persists, it is most likely that the exam scores will slip drastically by the time the child is in Primary 5 & 6. Why do so many Singaporean students struggle to speak fluently and write competently even after years of Chinese tuition and enrichment? The main reason is these kids come from English-speaking families. The teaching methods used in Chinese tuition and enrichment centres are ineffective and insufficient to encourage kids to speak up. With the teachers speaking/teaching most of the time and little time for kids to practise speaking, it is impossible to learn to speak good Mandarin. Besides, the huge class size in tuition centres and Primary schools means teachers are unlikely to be able to provide sufficient time for individuals to practise speaking good sentences. The heavy dependence on worksheet-based activities/readers and overemphasis on word recognition also creates a false impression of competence. Without the ability to speak good Mandarin and express one's thoughts/views fluently, it is nearly impossible to write well. 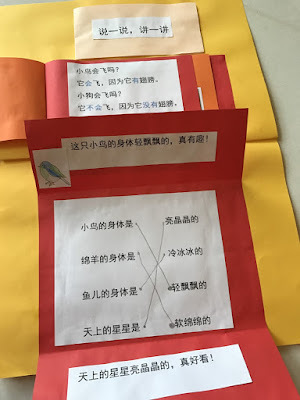 Even when kids come from a Chinese-speaking or bilingual environment, they may not necessarily find it a breeze to excel in the 作文 component. Writing compositions requires more than a strong language foundation. Besides this, the student must master the writing techniques which are expected of them, but not always effectively taught in schools. 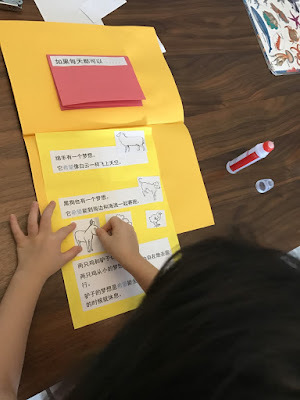 Dolly has been working on a new Chinese lapbook at home, in addition to attending my Bright Minds Lapbookers class. 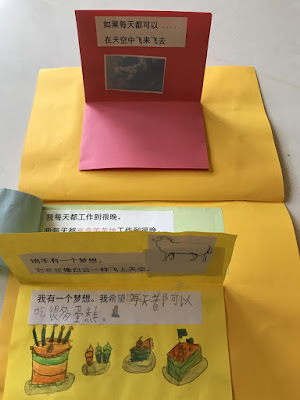 These shots of her work-in-progress Chinese lapbook shall offer a sneak peek. Two pages from the literature that we use for this lapbook. For a K2 child, Dolly speaks very fluently and can express her views coherently most of the time. 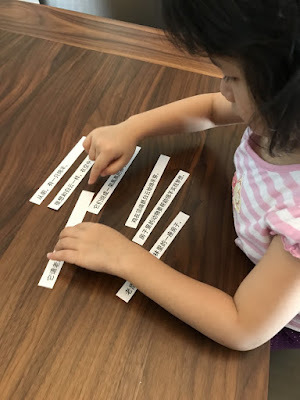 Hence, her lapbooking activities are introduced in such a way that she is learning the variations in sentence structures and building strong vocabulary to express her views verbally and in writing. Through this lapbook, she learns 12 new sentence structures and over 25 phrases. 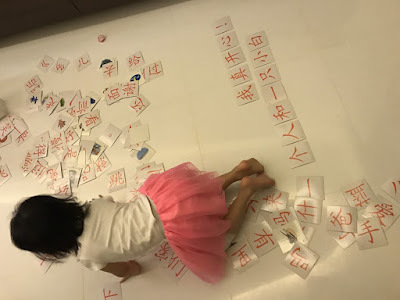 Not only does she have to use these phrases actively in order to complete the lapbooking activities, the process builds on the skills essential for her to master Primary School curriculum, especially in the components commonly deemed as the most challenging, specifically Oral (口试), Composition (作文) and Comprehension (阅读理解). Learn more about Chinese Lapbookers HERE. Sign up for Term 3 classes are FULL. Sign up for Term 4 classes. Details HERE.